I’ve been working on designing a daypack backpack for the last 6 months. To be honest, I haven’t used a backpack since university and find myself needing one now. Oftentimes, I’m carrying my 1 year old little man around and need to carry all my stuff hands free. For me, it’s one part work bag and one part diaper bag. I think there comes a point in our lives where we have to re-visit the backpack, whether you’re biking to work, using it because you’re a mom or dad, or you just like the freedom of using a backpack. My question is, how do I design a backpack that looks professional (not like you’re still in high school), is functional and gender neutral? I came up with the initial design last October, so this is version #2. 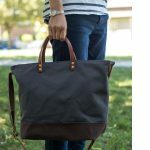 I want this bag to be really versatile, so other than a backpack it can be a briefcase and a shoulder bag. 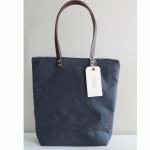 This would work with either an added shoulder strap or interchangeable straps. I’m pretty happy with this design. I’m using it right now to test and overall I like it. 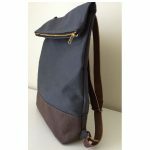 The shoulder straps are comfortable and the front pockets are useful to put my scarf, umbrella and water bottle in. It carries all my belongings in 4 separated inside pockets, along with my 13″ MacBook Air laptop. There are still a couple of minor adjustments to be made. I would like it to carry a 15″ MacBook Pro, so the size needs to be slightly bigger and perhaps the backpack straps can be detachable. 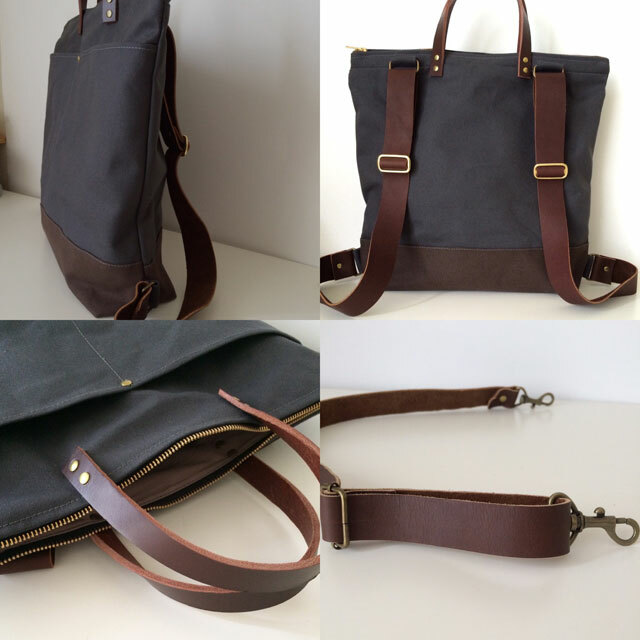 The body of the bag is lightly waxed canvas. The hand-held straps are bridle leather and the shoulder straps are a full-grain cowhide leather. Solid brass and antique brass hardware throughout.